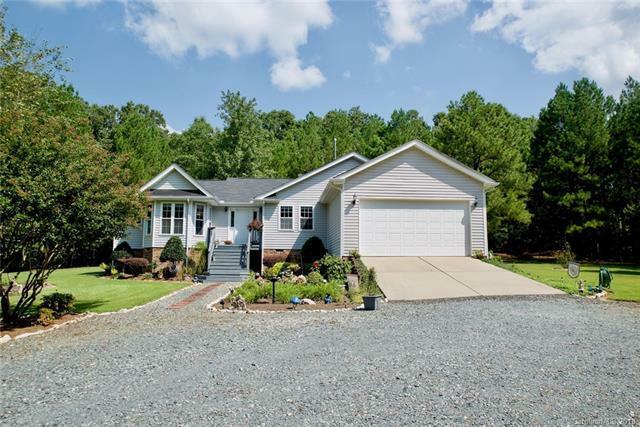 Very Private Ranch Home on 5.7 acres located in Waxhaw! This is the home you have been waiting for! 3 beds 2 baths. Open floor plan. Spacious living room w/ hardwood floors, vaulted ceiling and walk around gas fireplace. Large Kitchen w/ tons of counter space. Breakfast area with bay windows. Tons of Natural Light. Separate dining area with built-ins. Large Master Bedroom w/ vaulted ceiling, Dual vanities, whirlpool tub, shower, and walk-in closet. There is a small sunroom off of the master with its own exterior door to a small private deck. There is a second larger deck off of the main living area with built in recessed Hot Tub!! The yard is simply gorgeous with tons of flowering plants, bushes, and a rose garden. No HOA. 2 car attached garage.Feed the deer nightly from your back deck and watch wildlife abound!